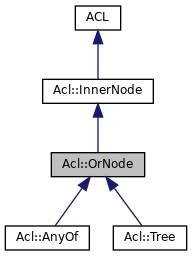 An inner ACL expression tree node representing a boolean disjuction (OR) operator applied to a list of child tree nodes. For example, conditions expressed by multiple http_access lines are ORed. Definition at line 60 of file BoolOps.h. 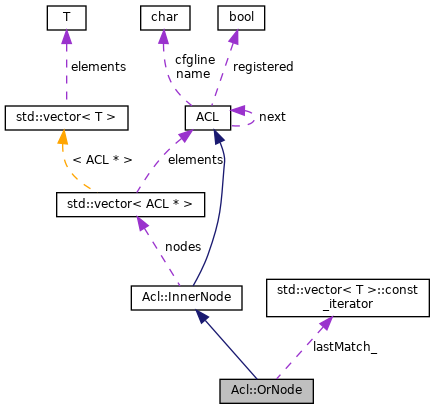 Referenced by Acl::Tree::add(), Acl::InnerNode::childrenCount(), Acl::InnerNode::lineParse(), Acl::NotNode::NotNode(), Acl::AllOf::parse(), and ParseAclWithAction(). Definition at line 122 of file BoolOps.cc. Definition at line 128 of file BoolOps.cc. References i, ACLChecklist::keepMatching(), ACLChecklist::matchChild(), and Acl::InnerNode::nodes. Referenced by Acl::Tree::actionAt(), Acl::Tree::add(), Acl::InnerNode::add(), Acl::Tree::bannedAction(), Acl::InnerNode::childrenCount(), Acl::AllOf::doMatch(), Acl::NotNode::doMatch(), Acl::AndNode::doMatch(), doMatch(), Acl::AllOf::dump(), Acl::InnerNode::dump(), Acl::InnerNode::empty(), Acl::InnerNode::match(), Acl::AllOf::parse(), Acl::InnerNode::prepareForUse(), Acl::InnerNode::resumeMatchingAt(), Acl::Tree::treeDump(), and Acl::Tree::winningAction().